Polycom Acoustic Fence technology keeps business conversations free from extraneous noises and distractions by dramatically improving the most important component of the VVX experience – voice clarity. Polycom makes this possible by automatically reducing background noises – co-workers’ chatter, loud machinery, or even barking dogs for example – using advanced echo cancellation techniques to “cancel out” all soundwaves except the actual speaker’s voice. Polycom Acoustic Fence uses multiple microphones to create a virtual “audio fence” so that sounds from “outside of the fence” are blocked from being heard by remote participants. The end result reduces and allows remote callers to hear and focus on the meeting at hand. 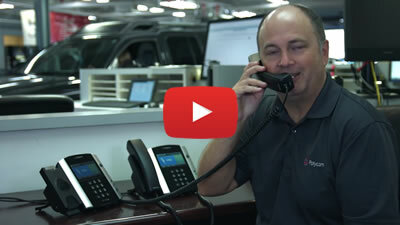 Discover our open standards approach to desk phones. Get a first-class phone experience with enterprise-grade audio, video, and applications support with robust interoperability. The person on the other end of the phone call will clearly hear your voice – and only your voice – and will not have to interrupt the conversation by asking you to repeat yourself. For call centers and busy offices reducing the duration of the call time is important. Acoustic Fence will reduce wait times and the number of calls in the queue.